What Is BTCClicks? Legit Bitcoin PayOuts or Time-Sucking Scam? When I say lucrative, I'm not talking about the users. The problem with paid to click is that it takes a lot of time, and you only earn pennies. Don’t have time to work for pennies? Check out our number one recommended program to make money online. For most people reading this review, you’re probably more interested in viewing Ads to make money, rather than spending money to advertise. Before I talk about how much you'll earn, it's important to understand the process. For example, most Ads pay from .00002 to .00004 of a milliBitcoin (mBTC). The equivalent in US dollars today is .0003 to .0006 so you’re looking at Ads for hundredths of a penny. It's nice that they tell you how many seconds to view and how much it pays... but it doesn’t really matter. The amount you earn is so minuscule that if you decide to use BTCclicks to earn mBTC's… just work your way down the list of Ads.There is no need to pick and choose. The bigger issue will be running out of Ads to view. There is no question, this is a tedious method of making money. Although Rinse and Repeat sounds simple enough… it’ll get exhausting because you’ll be repeating this process thousands of times to earn pennies. If spending countless hours earning pennies sounds like a waste of time, it is. There are other options to making money online. The real question, is figuring out what your time is worth… and in my opinion, it’s worth far more than BTCclicks can pay you for it. 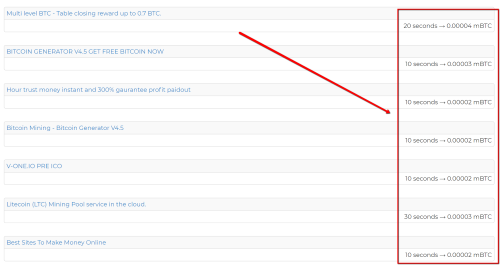 BTCclicks is free to join... but in my opinion, it’s extremely expensive. You’re chasing pennies while learning nothing. Unless you get a bizarre sense of pleasure from viewing Ads, I would recommend you do something else to earn money online. It's all about the money, so let's talk about the money. Bitcoin today is shaky at best... sitting at $15,000 USD. That means today... one milliBitcoin (mBTC) is worth $15.00. The minimum payout is 0.1 of a milliBitcoin, or one tenth… which is $1.50. As Bitcoin value changes... you can do the math. If it climbs to twenty thousand in the next 4 seconds (Bitcoin value isn't very stable)… 0.1 mBTC will be equal to $2.00 USD. If it goes to fifty thousand before my coffee is finished? $5.00 USD. It's also possible that Bitcoin trips, falls, bangs it's head... and wakes up at a painful $1000… If that were to happen, 0.1 mBTC would be worth ten cents. How Many Ads Do You Have To Watch? How many Ads, and how long will it take before you can withdraw your mBTC’s? I don't know about you, but when it comes to reading someone else's math... my eyes glaze over. If you can, though, stick with me here a moment while we go over a few more numbers. (I know, I'm sorry. But hey... it's not like you won't be doing a ton of captcha math if you join BTCclicks). For the standard BTCclick membership the average payout per Ad is between .00002 to .00004 mBTC. We can split the difference and call it .00003 mBTC. All we need to do is divide 0.1 (our minimum payout) by .00003 (the payout per Ad) to get the number of Ads we need to view. As long as my calculator isn’t broken… that's 3,333 Ads you need to view. Going with the minimum viewing length of 10 seconds per Ad… multiplied by the number of Ads (3,333)… it’ll take you 33,333 seconds. Convert that to minutes, you get 555. And finally... to hours.... 3,333 Ads will take approximately 9.25 hours to look at. A full nine-hour day looking at Ads for a staggering dollar fifty ($1.50)… minus the 1.5% withdrawal fee. The key to making money with PPC websites is by referring traffic to them, and earning commission from your referrals. On paper, this may sound great… but as someone with an online business, I can tell you it may be tougher than you think. 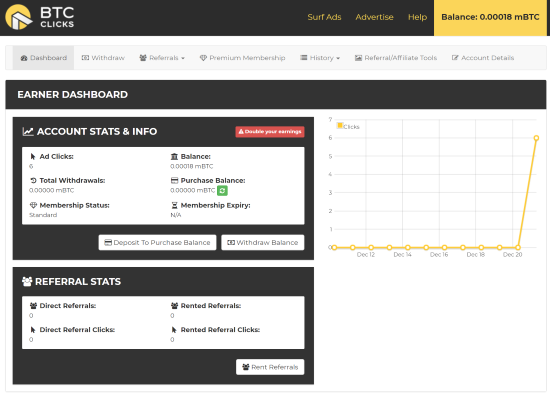 Standard members receive 80% commissions on their referral traffic. According to the BTCclicks FAQ, referral traffic is worth .00002 mBTC. Remember… your goal is 0.1 mBTC. If we divide that by the average .00002 mBTC per referral, we get the number of Ads your referrals must view. It works out to 5000. Great! If you can 10 referrals to watch 500 Ads each, you earn a buck fifty for doing nothing. Here’s the problem. Online conversion rates are not very high. The number of clicks you need to get those 10 active referrals is a lot. With no online marketing experience (and even with online marketing experience) a 10% conversion rate is a challenge. But since 10 is simple math, so we’ll go with it. To get 10 people to sign up and join BTCclicks (as your referral) with a 10% conversion rate, it will require 100 people to click on your referral link. But those are just people who just sign up to BTCclicks… that doesn’t mean they’ll do anything with it. With any luck, 10% of your referrals will actually view 500 Ads (earning you $1.50). So… 10 Ad watching referrals will require 100 sign-ups. At a 10% conversion rate, that means you need 1000 clicks. Where are you going to get 1000 clicks? If you buy them, good quality clicks can cost more than a dollar each. However, some experienced online marketers can find them for .50 each. If you’re good at buying traffic… 1000 legitimate clicks will cost you $500. $500 for a dollar fifty revenue? That's not going to work. Unfortunately, free quality clicks are the “holy grail” of online marketing. And, just like the holy grail... not easy to find. You might post your links on a few forums, social media sites and on blogs and get a few clicks. But not enough to gain any traction or momentum. Typically it can take a hundred or more captured views before you get a single click. By captured, I mean… someone has noticed your link. Not just scrolled past it. If you get 1 real click per 100 views, your 1000 clicks are going to require 100,000 views! And, if you're an experienced online marketer who can get consistently drive that much traffic, you are probably not here to learn about BTCclicks. There is a third way to get referrals. You can rent them. Everyone who rents referrals (and sells clicks for that matter) will tell you their's are high quality. High quality clicks are from real people (not bots) who have NOT been burned-out (bombarded with hundreds of other offers). But, in the online world of buying traffic, you just don't know what you're buying. You won't know until you blow through a few hundred bucks to find out. And, when you're only earning pennies, it doesn't make sense to spend money testing traffic sources. With high quality referrals, you have the same problem. There are no guarantees your rented referrals will even look at those Ads, but you're still on the hook to pay them. In addition, you need to keep track of your rented referrals, so you know when to drop them and rent new ones. It’s not a money-making machine. And even if it was… we’re still talking about fractions of a penny. There’s an outside chance of earning good money here… which is simply by owning milliBitcoins. Many things that today are normal, were at one time considered crazy (run-down million dollar homes in what were once seedy neighborhoods for example). Therefore... it’s within the realm of possibility that Bitcoin (which is $15,000 today) could reach a million-dollar value. If you had a single mBTC (already earned and withdrawn) it would be worth $1000. But... it’s also a strong possibility that Bitcoin collapses because it isn't backed by anything. If you’re a person who just surfs social media all day or night… BTCclicks could be a better use of your time. Since you’re here to find out what BTCclicks is however, your curiosity shows that you have ambition, want to make real money online, and that you're probably not someone who likes to waste time. If you’ve read this far… you’ll know my biggest issue with BTCclicks (and similar PTC websites) is that the payout is minuscule for the time required. If you’re serious about making money online, there are much better ways to do it. I don’t like that there are no names or faces behind BTC Clicks. They have a record of paying their users, but the secrecy (and being located where governments can’t reach them… which I’m sure is no accident) does not create an environment of trust. BTC Clicks is a real website where you can earn real crypto-currency. It’s just that the return on investment is exceptionally low. Could Bitcoin ever reach an astronomical value? Many would say it already has, and that it won’t go much higher. Others point out (correctly) that Bitcoin was created from nothing, and is based on nothing… except scarcity. If you spend months, or even years, building a small stockpile of mBTC’s (a single milliBitcoin would take approx. 900 – 1000 hours of viewing Ads) there’s a small outside chance they will have some value one day, but personally… I wouldn’t invest that kind of time to find out. If you're just starting out and learning to make money online, BTCClicks is a step in the right direction. However, it will NOT provide financial freedom and time. To truly build multiple streams of passive income and a future you love, online marketing is the undisputed king. Finding a legit system with all the scams out there, though, can be a pain. I spent many months testing different training programs and you can read about my top recommendations HERE. Fair warning though, none of these are get-rich-quick schemes. They are educational products that take time and effort. btcclicks is a big scam for two weeks now. i have just reach the withdrawal limit and requested for withdrawal and a mail was sent to me for approval, believe me up till now i have not received any dime after four month of working with them please i advice people to stay away from it is a scam not paying. Hey Lawrence, thanks for the info and sharing your experience, it’ll be helpful to others. Sorry to hear about your situation. That’s one of the main issues with them. There are no specific people associated with BTCClicks. We don’t know who’s running it so no one can be held accountable. Other than getting in touch the way you already have I don’t have any suggestions, but again, I appreciate your insight and I’m sure other readers will appreciate it too. I have been on BTCClicks since November last year (2017), and I have to confess that, it is now that I have caught the meaning that mBTC means that what I am being paid is 1 out of 10,000th of a thousandth portion of one bitcoin. That is actually a waste money because of the cost of INTERNET DATA I have to buy every month. Thanks for leaving your comment, but also sorry to hear that you’ve spent that much time for such a low return. I have actually tried this kind website before. Like you say the pay is really very, very small. You would be far better off taking an extra job then watching ads. Also I doubt that this is really good for advertisers either. If someone looks at ads because they are paid for it, would they really be interested in buying what you advertise?? No, I don’t think soo. This kind of traffic can never be targeted and I really doubt that it would be of much use. There are far better ways to earn money online than PTC websites. Thanks for doing the math. I’ve read about a few pay per click businesses now and the pay is always minimal to non-existent. I think until people see the math, they want to trust that the ppc company is not just a scam. Its too bad there is no way to see how many people these companies cycle through or the average time for how long someone stays with it. However, like you mentioned, if you are clicking while doing something else, it somewhat monetizes your fussing around time. Hey Dr. Doug, thanks for you comment. You make a good point, I also wonder how many people they go through and how long people stick around until they realize it’s going to take a long time to earn real money. There are hundreds of these types of websites and they’re popular, so it must be a lot.